I love this!! Bill and I were JUST talking about how nice it is going to be when all our children can sit at the dinner table together. The Stokke Tripp Trapp highchair is something that can grow with your baby. As your baby ages, the highchair can adjust making it the one purchase you need to make to satisfy your feeding needs. We know how many PRODUCTS we buy as new parents. My house is practically exploding! It’s nice to know that one product can function on so many levels. The Tripp Trapp® elevates your child to the optimal and correct seating position and can be used between 6 months to 3 years of age. Tripp Trapp®’s design, including adjustability of the seat plate and footrest in height and depth, enables correct ergonomic sitting. This improves posture and support to your child’s developing spine whilst providing legs and feet with full freedom of movement for the adjusting and shifting of body weight. The Tripp Trapp® chair meets and complies with all international safety standards. Fully adjustable children’s chair for many years. Both seat plate and footrest can be adjusted in height and depth, providing a chair custom fit for your child. Allows your child to be seated safe and comfortably from 6 months until teenage years and older. Easy reach and easy to assemble. The ability to adjust and raise Tripp Trapp® to the correct elevated position at the table makes it easy for you and your child to reach food, toys and utensils. Reduces strain for both you and your child. Strength and stability. 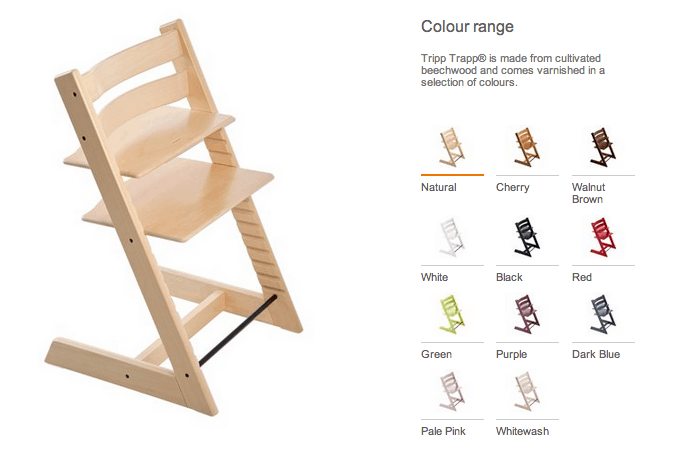 Tripp Trapp® is made from strong and resilient beech wood which contributes to higher safety. Protective coating. Protects Tripp Trapp® with a high quality varnish. Provides a smooth and resistant surface, which reduces scratches and makes your highchair easier to clean and maintain. Individual colors. Tripp Trapp® is available in a range of colors. Enables you to choose the colour which best compliments your interior color scheme and household furniture. Want colors? I’ll give you colors! There are 11 to choose from. Have a little fun with this dinner table extension! 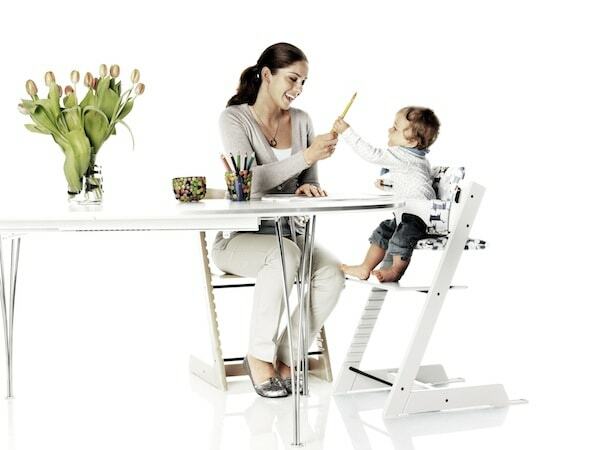 For more information about the Stokke Tripp Trapp, click here.